Snøhetta, the highest mountain on Dovrefjell, in the winter. Dovrefjell is a mountain range in central Norway that forms a natural barrier between Eastern Norway and Trøndelag, the area around Trondheim. As a result, its valleys and passes have been heavily trafficked during and probably preceding historical times. Several mountain inns were established in the Middle Ages to house pilgrims traveling through Dovrefjell to Trondheim, and there are even ruins of an old leper colony in the northern area of it. The main south-north highway (European route E6) and the Dovrebanen railway line both runs through the Dovrefjell range. The highway is a year-round highway but on rare occasions it is closed for short periods during heavy winter weather conditions. The mountain range runs through the municipalities of Oppdal in Trøndelag county, Folldal in Hedmark county, Dovre and Lesja in Oppland county, and Sunndal in Møre og Romsdal county. The municipalities of Oppdal, Folldal, and Dovre, together, make up what is sometimes known as the Dovre Region. As it is a natural habitat for many rare plants and animals, much of the Dovrefjell range has become a national park in several stages starting in 1911, when some plants were put under protection. When the railroad was built from Oslo to Trondheim in 1921, one of the marshes was preserved. In 1974, parts of the range became a national park and the park was extensively enlarged in 2002. Together with Rondane, it has Norway and Europe's last stock of wild reindeer of Beringian origin. 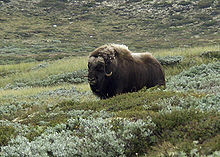 Dovrefjell (west of E6 / the Dovre Line) also has a stock of musk oxen, imported from East-Greenland in 1932. Dovrefjell-Sunndalsfjella National Park, founded 2002, which encompasses the previous and much smaller Dovrefjell National Park. Dovre National Park, founded 2003, connecting the protected areas in the Dovrefjell-Sunndalsfjella National Park with Rondane National Park. The highest mountain in the region is the 2,286-metre (7,500 ft) tall Snøhetta. The range provides cross-country skiing and hiking opportunities. The river Driva, running north through the municipality of Oppdal, has its source in the Dovrefjell range. The first element refers to the geographic area, Dovre. The last element is fjell which means "fell" or "mountain". It is common to use the shortened form Dovre also for the large mountainous area around Dovrefjell (see Dovre Region). From the oldest times has Dovrefjell been the border region between the northern and southern parts of Norway, and the road over the mountain was well known. The expression "til Dovre faller" ('until the Dovre mountains fall') is widely used in Norwegian. It was used in the oath sworn during the Norwegian Constituent Assembly in 1814, when Norway formed an independent nation after being in union with Denmark. At this time it was assumed that Snøhetta in Dovrefjell was the highest mountain in Norway, since the higher peaks in Jotunheimen were fairly unresearched. Dovrefjell is a residual massif, which is a mass of rock that has stayed in place as the surrounding relief has been eroded. The tops of Jotunheimen and Dovrefjell and other parts of southern Norway are the few remnants (see summit accordance) of a formerly flat surface that existed in Norway before uplift. This surface is now largely eroded and warped. That erosion formed a series of steps and from the highest of these steps Jotunheimen rises. ^ Lidmar-Bergström, Karna; Ollier, C.D. ; Sulebak, J.R. (2000). "Landforms and uplift history of southern Norway". Global and Planetary Change. 24: 211–231. Wikivoyage has a travel guide for Dovrefjell. Wikimedia Commons has media related to Dovre (mountain range). This page was last edited on 9 April 2019, at 15:38 (UTC).